The two words “Influential” and “Libertarian” never belong in the same sentence. I’m a bit Instapundit fan, but hardly consider Glenn Reynolds a libertarian and wonder if he does. He’s positively in love with anything to do with war and spies, which is enough to eliminate him. I don’t understand your post Nicolas. 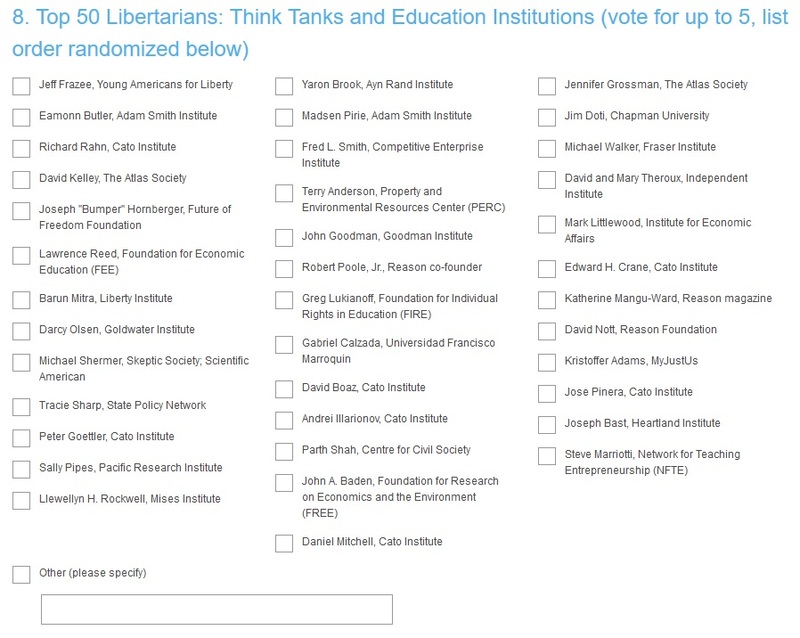 There was never a time when those people on your list were the sum total or even current state of libertarianism. And why would you want it to be? @ SP: absolutely right. You missed Instapundit? You didn’t do your homework. No Glenn Reynolds? Someone isn’t doing their homework, so despite being a libertarian, I’ll not waste my time. Next year start a category of healthcare and health policy. Would aspire to be there with MF Cannon, T. Stossel and others! 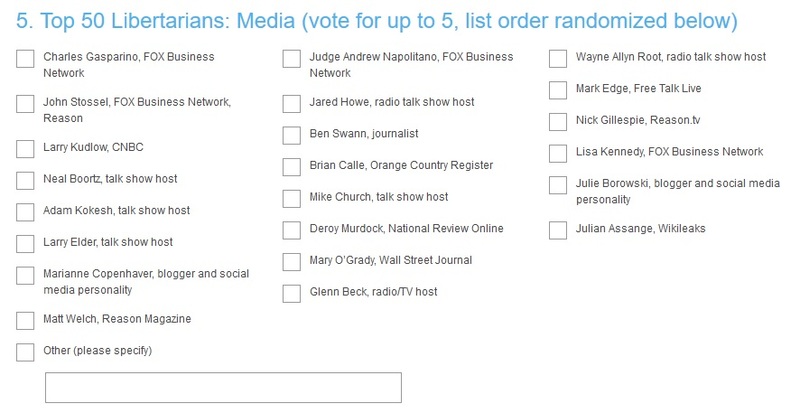 They won’t let me vote for just the first category . . . 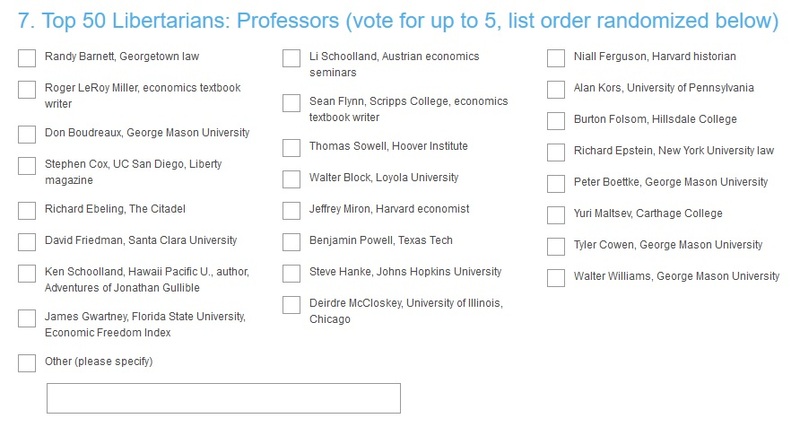 I personally believe that neither Russ Roberts or John Cochrane being on the lists from the professor/institution perspectives is an oversight, but aside from those this was a great list to choose from. And I have a couple of competing emotions when reading this list. 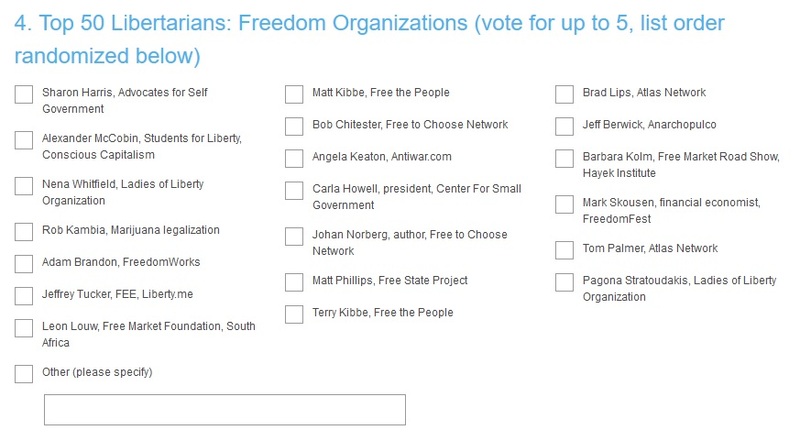 The positive is admiration and respect for the amount of extremely articulate and intelligent people on the list who are doing yeomen’s work espousing limited government, individual liberty, and free market ideals. However, I can’t help but be disappointed looking at the smallness and the relative effectiveness of the politician list. Is there a longer-term grassroots way of remedying this? 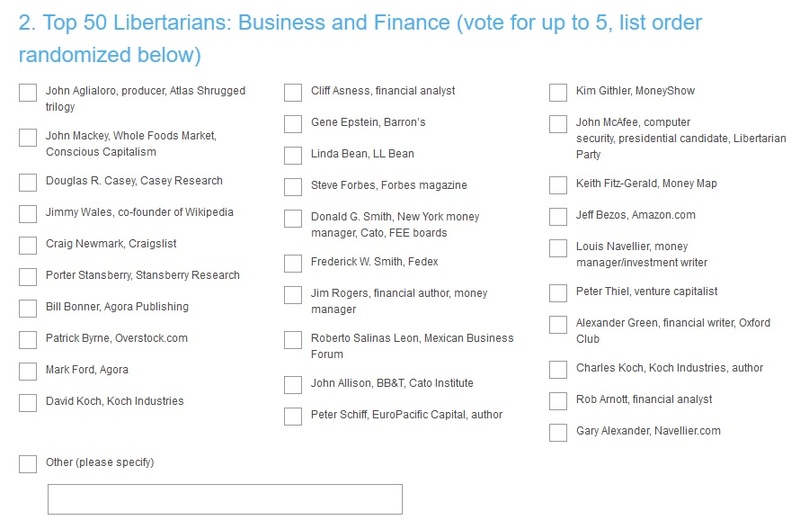 Unfortunately, “Most Influential Libertarian” is kinda like “Driest Ocean” or “Least Corrupt Politician”.